is a former full Professor of the University of Bologna. He is Foreign Member of the Russian Academy of Natural Sciences; Emeritus Professor of the Cultural Heritage Institute of Zhejiang University, China; Visiting Professor of the Academy of Social Science of Zhejiang University, China; Visiting Professor of the Faculty of Arts, Lomonosov Moscow State University, Russia; former Vice-president and now, a Councilor of the Società Italiana per il Progresso delle Scienze (SIPS - es- tablished in 1839). His biography appears in the 2016 Marquis Edition of Who’s Whoin the World. He is the founder and director of two book series relating to the specificissues pertaining to the sector of cultural and environmental heritage. He is the author of over 420 publications in national and international journals and of 22 volumes and monographs covering commodity science, cultural heritage and environment. In 1997, he founded the Diagnostic Laboratory for Cultural Heritage at the Ravenna Campus of the University of Bologna and remained head of the Laboratory for eighteen years. Hisscientific work deals mainly with the study of the “system: artifact-environment-biota”and diagnostic, analytical, technical and economic evaluation within the context of the protection and valorization of cultural and environmental heritage. The historical-technical "Journal" was founded in 2001 in the University of Bologna, Italy. 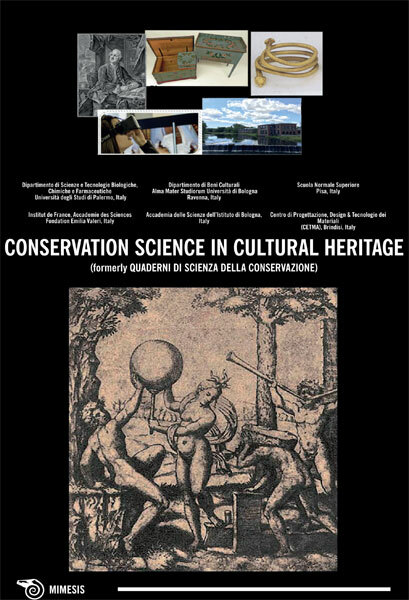 Published annually, over the years, the "Journal", formerly “Quaderni di Scienza della Conservazione” (Pitagora Editrice, Bologna), in 2007 with issue N.7, adopted an international format with the title “Conservation Science in Cultural Heritage” in English and available in electronic, as well as hard copy versions. From issue N.11-2011, the "Journal" is published by Mimesis Edizioni (Milano-Udine). The Advisory Board is composed of experts with different competences and cultural backgrounds. The "Journal" publishes interdisciplinary studies and experimental research related to the complex themes of protection and valorization of cultural and environmental heritage within an international context: the two key words being interdisciplinarity and internationalization. In short, the objectives pursued are of a scientific, institutional and communicational nature so that the quality of the information reflects the truth of science and clarity of communication. It is included in numerous international databases: EBSCO Publishing; DOAJ; ERIH PLUS; ESCI (Emerging Sources Citation Index – Web of Science, Clarivate Analytics); Scopus (Scimago Journal and Country Rank); ANVUR (Agenzia Nazionale di Valutazione del Sistema Universitario e della Ricerca – Classe A). The Journal also has important certification: SPARC Seal (Scholarly Publishing and Academic Resource Coalition) and a Creative Commons License. Lucio Colizzi is an Information Technology engineer. After many years of experi- ence in ICT, robotics, Virtual Reality and data processing and modeling, in 2001 he be- came the ICT department Director of CETMA. He has co-ordinated important national research programs and in the last ten years has also been coordinator on several pro-jects in the field of development of technologies for cultural heritage. He has obtained many post-graduate qualifications: BPR, Concurrent Engineering and Quality FunctionDeployment, STEP –ISO 10303, Simple ++, eM-Plant, eM-Planner, Informix Dynamic Server Administration and Performance Tuning, Design for Manufacturing & Assembly,Object Oriented design with UML, Microsoft certifications: C#, ADO.NET, ASP.NET;XML Web Services.NET; PROJECT MANAGEMENT (Bocconi University). As a result of his many interests he has taught “Project Management and Group Dynamics” as Adjunct Professor at the universities of Bologna and Lecce. Prof. Ferruccio Trifirò was born in Barce (Libya) on June 17, 1938. He graduated in Chemical Engineering at the Politecnico di Milano in 1963 under the guidance of Prof. Giulio Natta (Nobel Prize in Chemistry in 1963). In 1965 he worked at the Prague Academy of Physical Chemistry at the Academy of Sciences of Czechoslovakia. In 1968 he obtained a scholarship at the Department of Chemistry at the University of Reading (UK); in 1974 he won a scholarship (Alexander von Humboldt) at the Institute of Industrial Chemistry at the University of Erlangen (Germany) In November 1975 he was appointed professor of industrial chemistry at the Faculty of Engineering in Cosenza, Italy; in November 1976 he was called to Bologna University to work atthe Faculty of Industrial Chemistry. His main research activity has been in the field ofheterogeneous catalysis through oxidation and hydrogenation applied to the synthesisof the main intermediates and to a lesser extent in the field of homogenous catalysis, environmental catalysis and biomass transformation, through gasification chemistry, into raw materials. He is the author of 517 scientific publications, 24 patents, 5 books published abroad in English in the field of oxidation processes; editor of 8 books, 17teaching reviews and has made 400 presentations in congresses. He is the author of200 Italian articles in the field of chemistry. He is a professor emeritus of the University of Bologna; director of the magazine, chemistry and industry since 1996; president of the Academy of Sciences of the Istitutodi Bologna; scientific member of the OPCW (Organization for the Prohibition of Chemi-cal Weapons) and Scientific Adviser for Innovative Technologies for EnvironmentalControl and Sustainable Development (TICASS), a consortium in Liguria.